Please in order to make the forums tidy i would like to start this post in order to efficiently inform the Ateam Avia and Ateam Admin of every bug in the game for the month of August. [08-02-2018] Video spawn icon does not respond. Last edited by Albus; 08-02-2018, 03:48 AM. Where do we post about Notice typos? The latter two quests are greyed out for me, saying "Gear Score 400000 short." I guessed that the 400k is correct and the 240k is not. FREE 1 Time a Day! This "treat" is not available in the spawns. Last edited by Vegecat; 08-02-2018, 09:10 AM. Here. Just signal how it is displayed in the game and how it should be instead! 1) We'll get the Gear Score mistake in the notice fixed. 2) Yes, this is a problem. I will speak to the team and see if they can extend those Spawns as the notice is clearly incorrect. [8/1/18] Nitocris's Wind Unison Lock has no description. -When tapped on in a quest, the Wind Unison Lock effect displays "0.' Normally, it would be explained what this effect does when tapped on. This results in anyone who is unfamiliar with Nitocris and her effects not knowing what this effect is supposed to do. [7/31/18] Great Spirit Fortuna has no name when summoned as a support Unison. 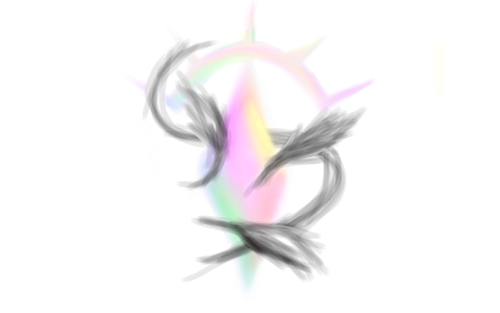 -If summoned as a Support Unison, Fortuna's name is simply read as 0 in the Support box (example: Sacred Ray Level 2, Support: 0). It should properly display Fortuna's name. This can result in people not knowing who the Support Uni is if they weren't paying attention. Vegecat, 0 is used as the placeholder when there isn't a translation ready or someone forgot to update the file with the correct translation. Let me look into getting these fixed. So I just checked and it looks like that text has never been translated, so it is being displayed as '0'. We'll need a few days to get this fixed. If they want to use 0, then before releasing new content, why not do a search (in this case, for all tooltips that contain exactly a 0 and nothing else, or that are exactly 1 character long, or whatever) and fix them on the spot? Why insist on releasing them without checking even once, then relying on consumers to do the work of catching these after the mistakes are already out there? Last edited by Gløwingly; 08-05-2018, 11:09 AM. Players that obtained this Super Reforge Quest Key during will have the Keys obtained removed and they Medals spent on the Keys will be given back during maintenance on 8/9. What about the people who spawned just to get keys, and would rather have their gems back than keep the gear and spend medals on something else? IDK if there are any for certain, but I know at least one person posted in another thread that they were going to spawn for the key *after* the quest was available, just in case (smart of them to save their gems, too bad for anyone else with the same priorities but who spawned before waiting for a confirmation I guess?). That's a valid argument Vegecat. I'm going to let our customer support handle that one as it seems there hasn't been many e-mails about this. Last edited by niconutela; 08-09-2018, 03:13 PM. 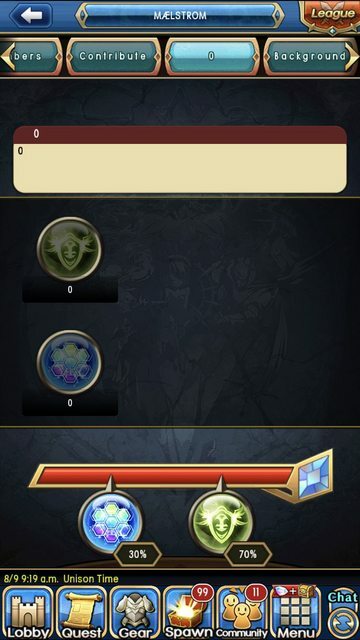 Something to add on, the ability to see the crystal's skill tab page is randomized. One of my sub leader's can see it and so far two other non-leaders can see. Two non-leaders, one sub leader and GL confirmed unable to see however. I saw this tab last night and sent a screenshot to myself. I'm back in the office now, so I'll have the team check this out. I just confirmed that that tab should be in the game. It is a feature that allows you to customize your Crystal, but it isn't ready yet and somehow it slipped through the cracks. We're working on getting that removed! Current Outcome: This week's UO does not appear and therefore cannot be quested. We're already looking into this one. Visual and audio bug, plus a rare Unison one. [8/9/2018] Replacing Moniker Man "music" with title screen music. -Use Quest Now to begin Moniker Man. 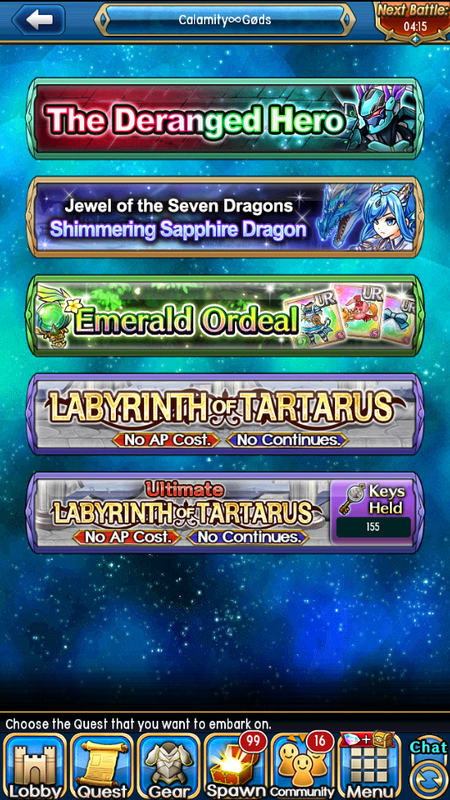 -After the screen has faded to black but before the quest actually begins, shut Unison League down. -Reboot the app and click past the title screen. The quest should now begin with the title screen's song playing in the background. The effect wears off at Wave 6, where the music changes to Soultaker's theme, or if you leave the quest in any way. This has no effects on gameplay, but the quest still feels a little weird (if not more cheerful) with this change of music. [8/9/2018] Incorrect sprite for Critical Hit Damage Down. The sprite for Critical Hit Damage Down has the speech bubble's "tail" facing away from the victim, rather than toward it. Normally the tail should point toward the character so that it appears they are...saying what debuff they have, for lack of a better term? Again, no effects on gameplay, it just looks a little weird. *Might also be Critical Chance Down, I can never tell those two apart. [8/9/2018] Unable to Unison for no reason. 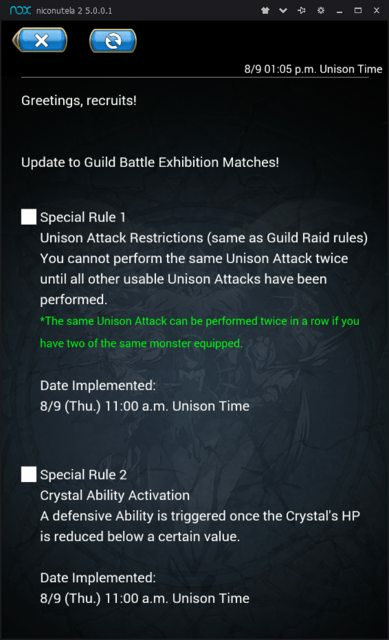 Very rarely, the game simply fails to recognize that a monster has been chosen to Unison even when all requirements are met (full Uni, monster not locked, no Prohibit Uni, no lag, etc.). When this occurs, tapping on monsters does nothing. This can result in battles being lost due to the inability to Uni. Of course, these are of secondary importance compared to the new problems this update introduced and I have no idea how you'd go about solving the last one with no more information, but waiting to report them won't do anyone any good. These are going on my list of things to check, but I'm going to bump them down for the more urgent stuff. I don’t know if this has been addressed yet or if it’s even a glitch but a tapsy spawn appeared (im not sure how to add a screenshot) but there’s no way to get the tickets to spawn it as far as I know. That's for https://forum.a-tm.co.jp/forum/uniso...ith-the-team-1 #7, right? I assume that when something or other expires, it'll be converted into tickets for this box. This is what Katty379 is talking about. Yes, this is the Box Spawn I mentioned in my post with things I talked to the team about. Leftover Box Tickets from events can be used here. Heal Mastery, Heal Mastery II, and Area Heal Mastery are not working properly; they are not giving the Ability Power boosts to their corresponding Abilities when used. They should be making the affected healing abilities viable for all players. Should add 5% extra to the 5% heal over time effect for a total of 10%, if used when bow or gun is in the main slot currently not working. I would recommend looking into all the passive class traits for all classes if they are working correctly. I have passed this along to the team. It seems that some players over on JP have been mentioned something similar. I'll let you know when I hear back from the team. When any of the warlord's elements are about to fade out and one is cast to replace it, the replacement is not shown and the previous one remains flashing. Can you send me a link to that video in a private chat? My wife and I have been playing since the last half hour and was about to farm for medals until we both joined a lobby and since now has us permanently stuck in an endless loading cycle. We’re hoping to go straight into the main lobby after a reset and jump into our guild battle. Can’t say the game is working has been giving me an networking connection issue after the main start screen at this point I highly doubt this games gonna be up and running for me. Hopefully this will be accommodated not just for me but for the others also experiencing this issue. For me it was like the only day I wanted to spend grinding on this and I’m out of hope so yeah. Thanks for the day I guess. Bummer. Apologies for taking a long time to reply to this. It was quite late over here in Japan, so we weren't able to catch it until the morning. This issue is older, it started at the time where video video spawns where open in EU again. All of this happened on Android Devices, I cannot speak for iOs. I am also from EU if that matters. Clicking on the Play-Button for videos never loads a video, the loading circle just continues endlessly. I'll make sure this is passed along to the team. Thanks for the response, also I would like to add that the normal video thingy at the top left of the screen in the lobby still works, I can watch videos for rewards there, it's only the video spawn that does not load videos.